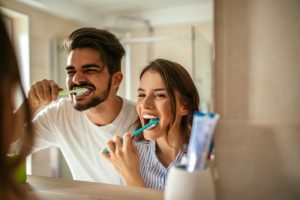 Dentists are always taking the time to learn more about their patient bases, as well as the rest of the country when it comes oral care habits. Thanks to increased dental health awareness and access to professional services, more people overall are visiting their dentist and performing at-home care. However, there’s always room for improvement. Today, your dentist in Medford will go over research studies that look at the dental care habits of men and women in greater detail and determine once and for all who’s the most committed. According to the Centers for Disease Control and Prevention, women are more likely to visit the dentist than men, especially in more recent years. By examining the percentage of groups who visit their dentist within the past year, the researchers found that 63.4 percent of men visited their dentist in the past year in 2013. In comparison, 68.9 percent of women saw their dentist, a 4.2 percent difference. While both groups are seeing their dentist more in recent years compared to 1997, a higher percentage of women have been visiting their dentist over a 15-year period. In 1997, 62.9 percent of men visited their dentist, which is a 0.5 percent difference compared to 2013. However, 67.1 percent of women visited their dentist in 1997, a 1.8 percent difference compared to 2013. Based on research from the Journal of Periodontology, women also tend to have a better attitude towards oral care habits and dental knowledge overall. In a study involving 800 people between the ages of 18 and 19, subjects were asked to complete a written questionnaire concerning their lifestyle, dental knowledge, dental attitude, and oral health behaviors. They also participated in an oral exam to see if they had signs of gum disease. In conclusion, women weren’t only found to be almost twice as likely to receive dental checkups in the past year. They were also twice as likely to schedule recommended treatments following checkups, had better indicators of periodontal health, and lower incidences of dental plaque, calculus, and bleeding on probing. The questionnaire showed they also had a better understanding on what good oral health entails and a more positive attitude towards dental visits overall. While the previous studies focused on people in America, the trend also seems to carry to countries in the East as well. According to research coming from the National Institutes of Health, the dental habits of 403 public officials between the ages of 20 and 64 in Chiba Prefecture, Japan showed a discrepancy based on gender. According to the data, 52.7 percent of the 207 males measured had not visited a dentist in the last year, which is much higher than the 36.7 percent of the 196 women to not visit their dentist in the past year. Regardless of your gender, dental visits are important for everyone! To confirm no dental disease is present, schedule an appointment today! Dr. Anthony Giamberardino earned his DMD degree from the Tufts University School of Dental Medicine. Regardless of age, gender, or any other background, he’s prepared to provide patients high-quality preventive, restorative, and cosmetic care. To learn more about his practice, contact him through his website.